THE CONCEPT of injecting water into the internal combustion engine has been around for over 50 years. But the desire to extract more power from the standard production engine has increased at a neck-breaking speed. ERL has just revived this old principle, applying the latest techniques in both electronic and mechanical engineering to take water injection into the next millennium. Is water injection new? : No. Water injection was used during WWII to surpress detonation in fighter aircraft and increase their service ceiling. WATER? Water exists mainly in a liquid state because that is its most stable inter-molecular structure. When we apply heat energy to it, its molecules begin to expand: a great deal of heat is absorbed during this process owing to water's specific heat capacity - approximately 4.2kJ/(kg.K). When the water changes from the liquid to gas state, large amount of heat energy is consumed in sustaining the process. The latent heat of evaporation is 2256kJ/kg, approximately six times more than gasoline! Does the water "burn" in the engine? : No. The water simply converts from a vapor to a gaseous state which absorbs huge amounts of heat, due to the energy required to transform it. SO WHAT? Because of its huge specific- and latent- heat capacity, water is the perfect liquid for regulating excess heat under certain engine-operating conditions, for example induction charge air cooling; but its biggest contribution is inside the combustion chamber where, under excessive loading, pre-ignition and detonation can otherwise occur. Such abnormal combustion is particularly common in force induction engines, where exhaust temperature can exceed 1600�C in a rotary engine! Will water injection increase my horsepower? : Yes, but not directly. Water injection works to eliminate detonation, also known as knock. The big gains come from the ability to increase boost as well as the full ignition advance allowed by the ECU when it does not detect knock. While the cooling of the intake charge will produce some power increases, those increases are cancelled by the charge space occupied by the water vapor. In other words, there is slightly less room for air and fuel. However, by using up to 40 percent alcohol with the water, additional cooling takes place before the turbo, and the alcohol works as a fuel in the charge. This results in an increase in power. TURBO-CARS are easily upgraded in performance just by adjusting the boost pressure and upgrading the engine management system; but the hidden drawback of this solution is that even more fuel is being dumped -- as a coolant! -- to compensate for standard engine-cooling arrangements (inside the engine bay your fast-road car has more-or-less the same radiators and cooling fans as the family car next door). But as you upgrade your power-upgrade, you will get to the point where the fuel becomes so rich, and the flame is burning so slowly, that power is being lost rather than gained. HELP! Help is indeed at hand! The ERL Aquamist system, using sophisticated electronics to process engine-data, injects a precisely-metered quantity of coolant: not gasoline, but water, six times more effective, and freely available! (sometimes cut with alcohol) We eliminate fuel-dumping, leaving your air/fuel ratio unaffected, enabling maximum power to be extracted from the engine. To ensure that each rotor receives exactly the same dosage, we deliver the coolant in a fine mist: not only does Aquamist reduce the risk of damage ... it steam-cleans your engine with every rotation. 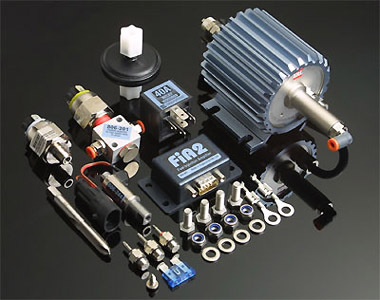 SYSTEM 2c Designed for use with third party Engine Management System. The kit provides all the necessary hardware to interface with the PWM output signal. SYSTEM 2d Latest addition for 2003 - Full 3-D water injection system without programming! It keeps track of the fuel flow and inject water with a fixed w/f ratio, change jet for different ratios. Display for monitoring water flow, user define warning levels for controlling external boost controller to reduce boost when abnormal water flow is detected.